The matchup in San Francisco on September 13, 1992 featured two teams who were preseason favorites to contend and had started off with solid wins in Week 1. The host San Francisco 49ers, under fourth-year Head Coach George Seifert, had beaten the Giants on the road while the visiting Buffalo Bills, coached by Marv Levy, handily defeated the Rams. Both teams had explosive offenses, especially Buffalo with its adroit use of the no-huddle. While the 49ers had been a successful team over the course of the previous decade, winning four championships, they faced questions coming into the ’92 season. Star QB Joe Montana had missed all of 1991 with an elbow injury and was still not ready for ’92. While his replacement, the mobile left-hander Steve Young, had performed capably, he had not always seemed comfortable in the offense and was looking over his shoulder at backup QB Steve Bono, who won five of six starts when Young himself was injured. The club was aging, but still had solid playmakers in wide receivers Jerry Rice and John Taylor and a promising newcomer in RB Ricky Watters. Buffalo had won two straight AFC Championships but lost both Super Bowls. 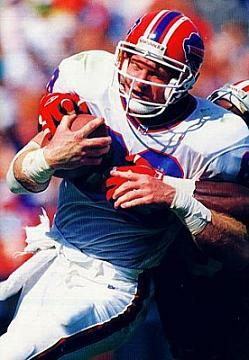 The nucleus of the offense consisted of QB Jim Kelly (pictured above), RB Thurman Thomas, and WR Andre Reed. They also had the aging-but-still-effective WR James Lofton and a good tight end in Pete Metzelaars, taking over for the injured Keith McKellar. It was a pleasant afternoon at Candlestick Park with 64,053 in attendance. The 49ers had the first possession and, with Steve Young completing six passes along the way, drove to the Buffalo 14 yard line. However, Mike Cofer was wide on a 33-yard field goal attempt. The Bills went from their 20 to the 47, but Jim Kelly fumbled when sacked by DE Larry Roberts and DE Tim Harris recovered for the Niners at the 40. Young ran for 13 yards on first down and, three plays later, connected with WR Odessa Turner for a 23-yard touchdown. Buffalo came back with an eight-play, 57-yard drive that featured Kelly pass completions of 20 yards to Pete Metzelaars and 23 yards to Andre Reed. Steve Christie kicked a 41-yard field goal and the score was 7-3 at the end of the first quarter. San Francisco, having lost Jerry Rice to a concussion in the first quarter, nevertheless put together a long scoring drive of its own. On a third-and-six play from his own 38, Young threw to Turner, who caught the ball at the 45 and, running down the sideline before cutting to midfield, got to the Buffalo five for a 57-yard gain. Two plays later RB Tom Rathman scored from two yards out and, with the successful conversion, the 49ers were up by 14-3. The Bills responded with a 73-yard drive in seven plays that included a Kelly screen pass to Thurman Thomas that gained 24 yards in a third-and-ten situation and a 30-yard throw to Reed. Kelly hit Thomas in the end zone for a 20-yard touchdown to close to four points once the PAT was added. The 49ers came right back as, on their first play after the ensuing kickoff, Young passed to WR Mike Sherrard for a 39-yard gain to the Buffalo 32. Ricky Watters ran for 20 yards but, after getting inside the ten yard line, the Bills defense held and Cofer kicked a 24-yard field goal that hit the left upright but was successful. San Francisco was up by seven. Following a short kickoff return, the Bills took over at their ten, but on a third-and-five play Kelly threw a short pass to Thomas who, breaking tackles, charged 43 yards into San Francisco territory. Following a 12-yard pass to Reed, Kelly threw for James Lofton in the end zone – the veteran receiver dropped the ball but the 49ers were assessed a penalty for roughing the passer. The 10-play, 80-yard series concluded with a 28-yard Christie field goal. Getting the ball back with 2:31 remaining in the half, the 49ers made yet another big play when Young threw to Sherrard for 56 yards to the Buffalo 24. After three running plays and a short pass, Young hit John Taylor in the end zone for a seven-yard touchdown. The 49ers went into halftime with a 24-13 lead. The big plays continued in the second half. In the opening possession, Buffalo scored on a 53-yard pass play from Kelly to Metzelaars. The Niners came back by moving from their 22 to the Buffalo 44 where RB Keith Henderson fumbled and star LB Cornelius Bennett recovered for the Bills. After a short run by Thomas, Buffalo went to the shotgun and Kelly completed four straight passes, the last for a 24-yard TD to Metzelaars. Christie’s extra point was good, and the Bills were in front by 27-24. On the second play of San Francisco’s ensuing possession, Young threw to Taylor for a 32-yard gain, but after moving into Buffalo territory the 49ers were again undone by a turnover. TE Jamie Williams fumbled after gaining 13 yards on a pass and the Bills took over at their 39 yard line. However, Buffalo turned the ball over on a fumble five plays later and the Niners then re-took the lead. Watters ran for 16 yards on first down but DE Phil Hansen followed up by sacking Young for a 10-yard loss. After an incomplete pass, the 49ers were facing a third-and-20 situation, but Young completed a pass to Taylor down the middle of the field who broke free of tacklers and scored a 54-yard touchdown. The third quarter ended with San Francisco back on top at 31-27. The Bills started off the final period by driving into 49ers territory as Kelly completed passes to Lofton for 20 yards and Reed for 14 along the way. But after getting to the 17 yard line, Kelly was intercepted by CB Merton Hanks to end the threat. Now it was the turn of the San Francisco offense to steadily advance the ball, with Young starting things off with a 19-yard completion to Sherrard. However, after reaching the Buffalo 39, CB Nate Odomes intercepted a Young pass. With Thomas running the ball effectively and Kelly completing four passes, the Bills put together a 72-yard scoring drive in 12 plays. After Kelly converted a fourth-and-four at the San Francisco 20 with a nine-yard pass to Lofton, Thomas ran up the middle for an 11-yard touchdown and, adding Christie’s extra point, the Bills were up by three with over three minutes remaining in regulation – more than enough time in this back-and-forth contest between explosive offenses. Young led off with a 21-yard completion to Sherrard and the 49ers advanced to their 47, converting a fourth down to midfield on a three-yard bootleg by the nimble quarterback. Young was successful on three straight passes – interspersed with two penalties called on the Bills – to get the ball to the Buffalo 29. They could get no further, however, and when Cofer missed a potentially game-tying 47-yard field goal attempt, the Bills were winners by a score of 34-31. “At times, I thought both teams were a little delirious,” said Bills LB Darryl Talley of the wide-open contest. The teams combined for 1086 yards with the 49ers gaining 598 to Buffalo’s 488. They also held a slight edge in first downs, 26 to 25. Each club turned the ball over three times. But the truly remarkable feature of the contest was that, for the first time in NFL history, neither team punted during the course of the game. Both quarterbacks passed for over 400 yards. Jim Kelly was successful on 22 of 33 throws for 403 yards with three touchdowns and an interception. 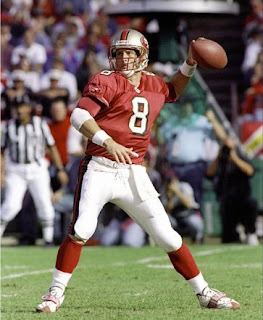 Steve Young had 449 yards on his 26 completions in 37 attempts, also with three TDs and one picked off. Each club also had two receivers apiece with over a hundred yards. 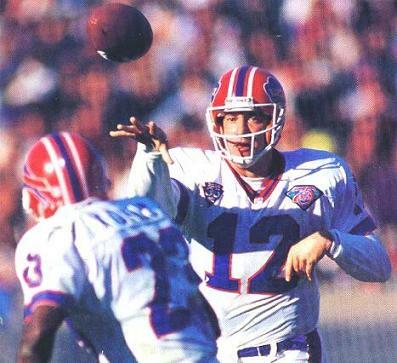 For Buffalo, Andre Reed caught 10 passes for 144 yards and Pete Metzelaars (pictured below) added 113 yards and two touchdowns on his four catches. With Jerry Rice sidelined early for San Francisco, Mike Sherrard had 6 receptions for 159 yards and John Taylor caught 5 passes for 112 yards and two TDs. Odessa Turner gained 80 yards on just two receptions. Thurman Thomas was typically formidable for the Bills as both a ground-gainer and a receiver out of the backfield, running for 85 yards and a TD on 19 carries and catching four passes for 94 more yards and another score. Ricky Watters led the 49ers in rushing with 83 yards on 16 attempts. Both teams went on to make it to the postseason. Buffalo went 11-5 to finish second in the AFC East, qualified as a Wild Card, and won a third straight AFC title. However, they also lost a third consecutive Super Bowl. The 49ers lost only one more regular season game as they topped the NFC West with a 14-2 record. The Niners advanced to the NFC Championship game, which they lost to the Dallas Cowboys. Jim Kelly had his third straight Pro Bowl season, passing for 3457 yards and 23 touchdowns, although also a league-leading 19 interceptions. Thurman Thomas also was a Pro Bowl selection as he led the NFL for the fourth consecutive time in yards from scrimmage (a career-high 2113), ranked third in rushing yards (1487), and caught 56 passes for 626 yards. Pro Bowler Andre Reed had 65 pass receptions for 913 yards. The hundred-yard receiving game for Pete Metzelaars against the 49ers was only the second of his career – he had 30 catches for 298 yards and 6 TDs in ’92. For Steve Young (pictured below), 1992 was a turning point in his Hall of Fame career as he received MVP honors (Associated Press, Pro Football Writers, Bert Bell Award) while leading the NFL in passing (107.0 rating), TD passes (25), and yards per attempt (8.6). He also rushed for 537 yards. Jerry Rice came back to have another stellar year at wide receiver, but of the big contributors against Buffalo, Mike Sherrard caught 38 passes for 607 yards (16.0 avg.) and John Taylor had 25 receptions for 428 yards (17.1 avg.) and three touchdowns in an injury-interrupted season.